Formerly the Grand Aston Bali, now the Hotel Nikko. Overlooking a beach, this elegant resort is 13 km from the Hindu sculptures at the Garuda Wisnu Kencana park and 19 km from lively Seminyak. Upscale rooms and suites with contemporary wood furnishings provide flat-screen TVs, free Wi-Fi and balconies. Suites add living rooms and ocean views. Room service is available 24/7. A breakfast buffet, a shuttle to a nearby shopping area and guided morning beach walks are complimentary. The resort has 5 restaurants, including an Italian option, and a lounge with regular evening piano entertainment. There's also a spa, an ocean-view outdoor pool, a fitness room and a kids' club, plus 3 meeting rooms. King or Twin bed (King's are subject to availability). 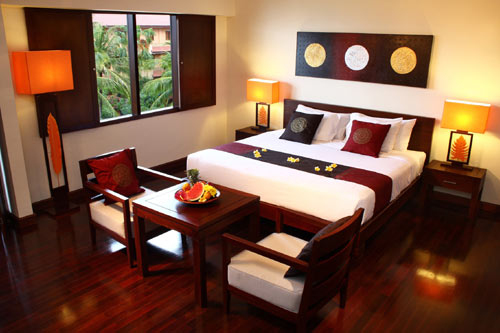 The Resort’s Deluxe Rooms are cozy and spacious. 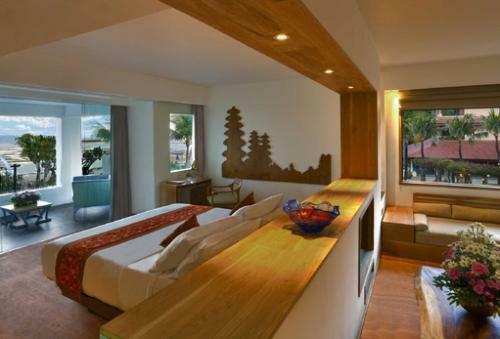 Each Deluxe room is 45 m2 offering a mixture of Balinese style and modern Western interior & comfort. 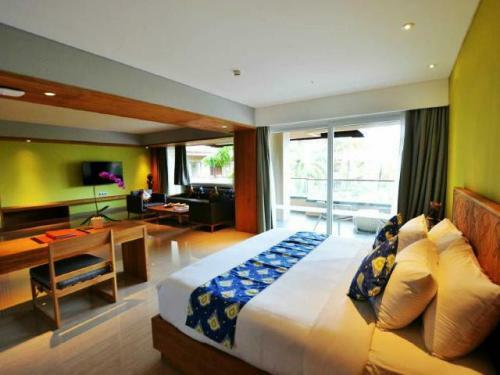 The modern fixtures and inviting décor will relax and pamper you, promising a most pleasurable stay. 1 King Bed. The interior of Ocean View Suites is a mixture of comfort, ethnic charm and luxury, fully equipped with all the modern facilities. Each Ocean View Suite features a spacious living room, one bedroom, and one bathroom with a total impressive 87 m2. The view forward facing directly to the Indian Ocean, overlooking the resort’s tropical garden as well. Enjoy the view either from the huge balcony or from the bed or living room windows. 1 King Bed. The interior of Ocean View Suite Premier is a mixture of comfort, ethnic charm and luxury, fully equipped with all the modern facilities. 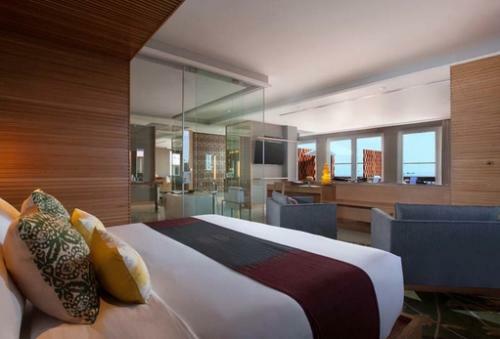 Each Ocean View Suite features a separated living room, one bedroom, designer bathroom. The view forward facing directly to the Indian Ocean, overlooking the resort’s tropical garden as well. Enjoy the view either from the huge balcony or from the bed or living room windows. 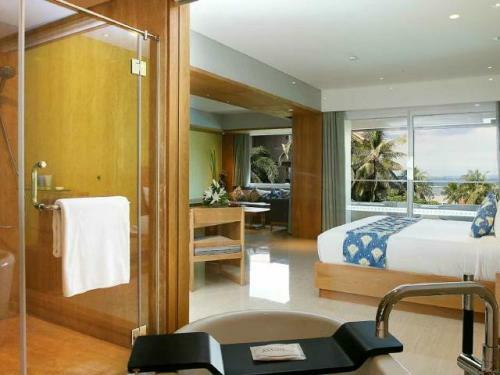 These suites are designed for those who wish to experience Bali in luxury and comfort. 1 King Bed. Ocean Front Suite promises true opulence with a touch of authentic Balinese culture and contemporary flair with size 86 sqm. Complementing your unrivaled resort experience, each Ocean Front Suite has a spacious balcony with daybed overlooking the glorious views across the Indian ocean. Ocean Front Suite promises true opulence with a touch of authentic Balinese culture and contemporary flair with size 86 sqm. Complementing your unrivaled resort experience, each Ocean Front Suite has a spacious balcony with daybed overlooking the glorious views across the Indian ocean. The latest facilities including large screen TV with surround sound, in-room DVD player, and complimentary wi-fi are perfect choices for your elegant lifestyle. The quintessential Ocean Front Suite offers the ideal location for relaxing in the spacious living room area with breakfast bar, enjoying the sumptuous bedroom with large balcony and fantastic ocean views. 1 King Bed. The fresh new room will encompass 160 square meters of living space with luxury lounge furniture giving a welcoming atmosphere. A direct view to the Indian Ocean equipped the room perfectly. Set with neutral tones and lighter décor have been carefully decorated and are fitted out with modern commodities to offer a pleasant and comfortable stay.Each room has different lay out from one to another room. Experience a place where you feel a sophisticated atmosphere of peace and harmony.